Robert Jamerson joins the Detroit PAL team as the Chief Operating Officer. Robert is a former PAL participant, coach, and consultant. Robert spent more than 20 years working for corporations, such as Phizer, Inc., before joining the non-profit sector. 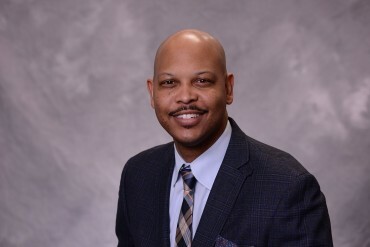 He has held leadership positions in sales, management, marketing, operations, and training, which makes him the perfect candidate to oversee the operations of Detroit PAL. He envisions PAL being the best at training and development, identifying gaps and needs in the community, and collaborating with others. Robert is a native Detroiter who grew up with Detroit PAL. He attended St. Martin Deporres High School, where he was a student athlete lettering in baseball, basketball and football. Robert graduated with academic honors and helped his football team win the State Championship in 1989. He was coached and mentored by notable Hall of Famer’s Ron Thompson, Eddie Rachel, and Greg Carter. Robert continued as a student athlete at Northwood University where he received his Bachelors Degree in Marketing/ Management and Associates Degree in Accounting. During his time at Northwood, he lettered in football and baseball. During his senior season, he achieved First Team All GLIAC Conference Football honors. Robert returned to complete his MBA in 2014. Robert has always stayed connected to the community through mentoring, volunteering, leadership training, business consulting, and life coaching. He is excited to be able to be fully committed to giving back to the Metro Detroit community. Robert is a big believer that it takes a Village!